In most places, whether it’s a house, restaurant, or office, wireless signal is often blocked or weaker than it can or should be. It can be extremely frustrating to not have proper signal. In many cases, it makes sense for people to use a WiFi booster. However, before you decide if you should buy a wireless signal extender, take a look at 10 common household features that may be blocking or impacting your signal. Here is a quick video outlining many of these elements. Here is a more detailed explanation of many of the elements that may be causing your wireless signal to be weak or unavailable throughout your house. While drywall is relatively low in terms of how severely it impacts wireless signal, it still provides a layer of interference. Additionally, it covers most walls in most homes so it is often a primary material used when building homes. Furniture includes your couches and chairs as well as any office furniture like cubicle partitions or other equipment that may be used. Generally, furniture is a relatively minor obstacle. However, if you have your router or wireless devices placed behind a couch or between a couch and a wall, you may notice weaker or slower signal. Windows, or clear glass, can impact your wireless signal. Because of how wireless signal is transmitted, even clear windows can reflect (or reject) wireless signal. Plus, many of the newer windows, even if they are clear, contain transparent films for blocking specific types of waves and can cause your wireless signal to suffer. Much like clear glass, tinted glass often contains additional elements that can reduce signal strength. Many tints contain various metals (metallic film). Metal is a huge killer of WiFi signal. 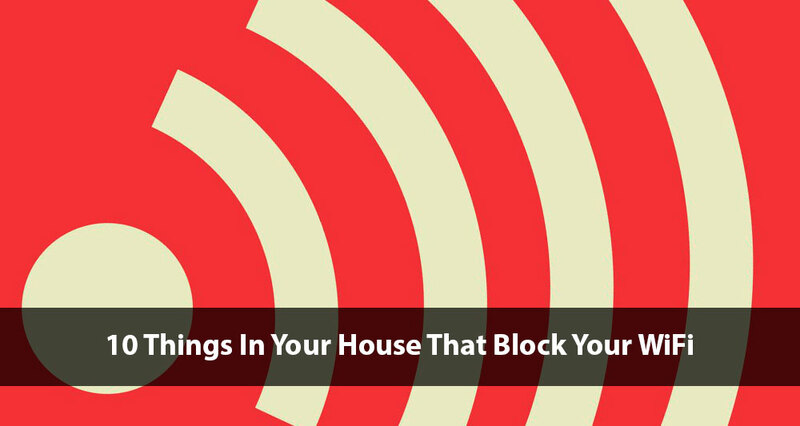 Because ceramic tile is so dense, it can have a greater impact on blocking WiFi signal in your house. Generally, ceramic tile is used in kitchens or bathrooms, so make note of this when figuring out where your wireless devices are setup. Depending on where you live, most foundations use concrete. Not only is concrete used for the bottom of the basement floor, it’s also used for external basement walls as well. This is a major factor if you’re interested in improving signal to the garage or outside of your house. Because mirrors are a reflective surface, they tend to negatively impact the strength of your wireless signal. Large appliances contain metal and other electronics. Both of those are known to cause interference with wireless signal. Just like above with appliances. Metal makes it extremely difficult for WiFi waves to pass through. In homes, it’s most common to have metal doors. Many offices also have metal doors, office partitions, and/or furniture. Water is one of the more severe obstacles for wireless signal transmission. If you have a large fountain or fish tank, keep that in mind relative to the placement of your wireless devices. While these aren’t in specific order, some sites have ranked wireless obstacle severity from low to high. There are other elements that may block or slow your wireless signal as well. If you are noticing extreme slowness or loss of signal, you should also test the location or placement of your router – whether or not you’re using a WiFi booster in your home or office.